Valentine’s Day is just a few days away! When you think of gift giving for this holiday, you may think of chocolate. It’s true, Valentine’s Day is chocolate’s day to shine, but here at New England Coffee, we show our love through a hot (or iced) cup of joe. With both chocolate and coffee on our minds, we took our two favorite beans (cocoa and coffee of course!) and found some recipes that married the two! If you are thinking of creating your own special treats for your special someone, browse our suggested recipes. They are classic, simple, and made with ingredients you most likely have in your cabinets. Chocolate Covered Espresso Beans are just the thing to energize your sweetie before hitting the town Sunday. 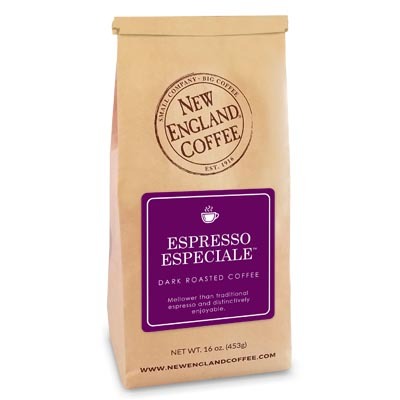 The few ingredients you will need are dark chocolate, cocoa powder, and New England Coffee Espresso Especiale whole beans. That’s it, only three ingredients and you have a homemade sweet treat that packs a punch. Coffee Sugar Cookies are another great idea to share with anyone on your Valentine list. The recipe posted by I Am Baker uses decaffeinated coffee but you can use any type of ground coffee you like, even flavored. We recommend using New England Coffee Breakfast Blend for a smooth flavor that will balance well with the sugar cookie. This recipe also includes a link to a Cherry Buttercream Frosting recipe and a Double Chocolate Chunk Coffee Sugar Cookie Ice Cream Sandwich. Now say that five times fast! Coffee Fanatic Chocolate Truffles The name says it all. These chocolates, like the Chocolate Covered Espresso Beans, are simple and require just a few ingredients. This recipe calls for ground Espresso, butter, unsweetened cocoa powder and dark chocolate. While we’re in a coffee mindset, how about gifting your own Valentine’s DIY craft? This DIY Coffee Sleeve may win the easiest gift idea ever award. Use the cuff from the sleeve of an old button down shirt to make the perfect coffee sleeve! But make sure to use an unwanted shirt and not your guy’s favorite shirt! If time is not on your side for these DIY Valentine’s Day gifts, you can always run to your local grocery store or the New England Coffee, retail shop and pick up your Valentine’s favorite New England Coffee!